Location: Irish Sportsturf Institute (ISTI), Poaceae Farm, Blessington, Co. Wicklow, Ireland. Date: from June 24th 2017 to Dec 30th 2017. Turfgrass canopy: predominantly (>85%) annual meadowgrass (Poa annua) with traces of browntop bentgrass (Agrostis capillaris) and slender creeping red fescue (Festuca rubra literalis). Protection: no pesticides of any type were applied during the trial. Irrigation: it was applied based on wilt assessments – at no stage during the trial was supplementary irrigation required. 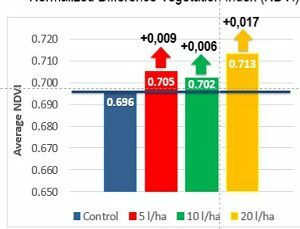 The applications of Aminoturf did not completely prevent the development of Microdochium nivale but did reduce it significantly in comparison to the untreated controls. 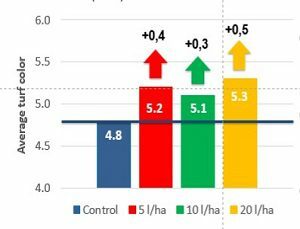 There was a significant difference between the control and the highest rate of amino. Treatment 2 and 4 resulted in significant differences compared to the control. Treatment 3 did not show significant improvement. Aminoturf´s invigorating and stimulating effect allows the grass to save energy during critical stages of growth and improves its recovery from abiotic stress due to climatic conditions. 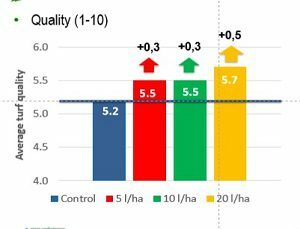 Best responses for all the parameters where achieved with the higher rate of 20 l/ha. The lower rates presents better results than the control, but not always significant. During October and November, the cooling impacts negatively on all parameters, with Aminoturf showing a great difference in performance. 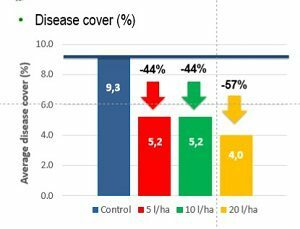 Great results with cover disease (-57%), color (+0,5) and quality (+0,5).